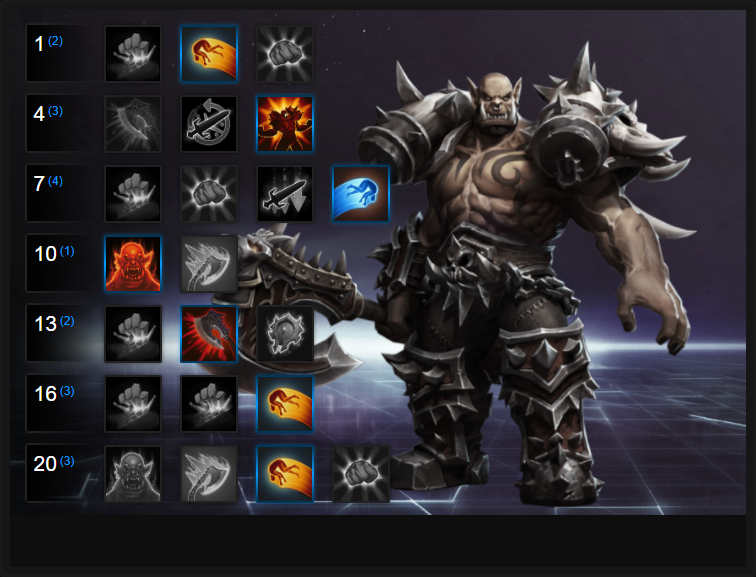 In this Garrosh Build Guide, we provide an overview of his strengths, abilities, talents and matchups. Garrosh is a long awaited Warrior that offers high survivability. With the last solo tank arriving many moons ago (Johanna), Garrosh enters the Nexus at a time where double-Warrior compositions are often status quo. What's particularly interesting about Garrosh is that similarly to Johanna he lacks mobility. Not only that, and also like Johanna, Garrosh can stun players with Groundbreaker, while also sustaining himself thanks to Bloodthirst (see below). Unlike Arthas or Anub'arak, Garrosh relies entirely on not only disrupting the enemy team through a combination of his Groundbreaker stun, but also his Wrecking Ball which allows him to throw a nearby enemy hero. Although his kit appears relatively simplistic, the combination of managing his Groundbreaker effectively, throwing the right target at the right time with Wrecking Ball, while also keeping an eye on your health (and that of your team), makes Garrosh particularly challenging to play well. As a hero that's easily kited by ranged attackers, you need to not only position well, but also keep an eye on your trait and your amount of armor. Unsurprisingly and due to Armor Up (also see below), Garrosh is at his strongest when he has reduced health and if shielded, is incredibly difficult to bring down. If he also makes effective use of either Heroic ability - which are both fantastic - he's a powerful addition to any composition. Finally, despite being a competent solo Warrior, Garrosh still performs very well in a double-Warrior setup and is more than capable of dealing consistent damage. Armor Up - Garrosh's Trait allows his to gain armor based a percentage of his missing health. Fundamentally, the lower his health is, the more armor he has and the less damage he takes. With armor in Heroes of the Storm maximizing at +75, Garrosh is able to obtain +50 before being near death (effectively 1 health). With his Trait providing this level of mitigation against all damage types, he can be incredibly difficult to kill. Typically and in a team fight, it's fairly easy for Garrosh to hover around the 30-35 armor mark, allowing him to take 30% less damage from all sources. If he then pairs with heroes such as Uther (who can provide additional, instant armor), his mitigation increases instantly. Be aware that just because you take less damage, doesn't mean you're invincible. If your armor is high, your health is low, meaning a quick burst from multiple sources can still finish you off. Groundbreaker (Q) - As Garrosh's primary form of crowd control, Groundbreaker has two purposes. The first is to deal damage in a cone to anyone in front of him who's caught in the telegraph. The second is that anyone caught on the tip of the telegraph (the very end), will be stunned immediately, before being slowed. With a brief delay before Garrosh slams his axe down to activate Groundbreaker (around a second), you need to not only time when to use Groundbreaker to ensure the stun, but also the damage component (if that's all you need). What's particularly strong about Groundbreaker is that anyone stunned immediately next to you can then be throw by using Wrecking Ball, for a double-the-dose of crowd control. Bloodthirst (W) - Providing Garrosh with some much needed sustain and instant damage, Bloodthirst allows him to restore 10% of his missing health instantly. Garrosh can cast this on any enemy, though the value is doubled against heroes. You're free to use this ability as much as possible during early fighting, but as your health gets lower, it's best to save it so you're always around 30-35% armor. It absolutely will save your life, and provides Garrosh with fantastic sustain when fighting 1 on 1. Wrecking Ball (E) - I have to admit that Wrecking Ball takes some getting used to and that's primarily because the throwing action is automated based on the nearest enemy to you. In a team fight where enemy heroes are grouped together, or if minions are nearby, it can prove challenging to snag the hero you want. However, with a little practice Wrecking Ball proves to be an incredibly valuable ability and I would state, one of the strongest in the game. What's important to remember is that your targetting of an enemy is based on a small radius around you (the inner circle) and your throwing location, the larger outer circle. Your chosen target is marked with a red Horde symbol, while an allied target a blue Horde symbol. This symbol will only appear once you're in range. Warlord's Challenge (R) - Acting similarly to Varian's Taunt, Warlord's Challenge is a brief AOE taunt that sees all nearby enemy heroes affected by it, attack Garrosh. The key difference between Varian's Taunt and Warlord's Challenge is the fact enemies taunted by Garrosh are also silenced. In a group environment and if Garrosh can pull multiple foes with Groundbreaker, the Taunt combined with its silence can be valuable. The only downside to Warlord's Challenge is the fact its radius is very small (the same width as Wrecking Ball) and it deals no damage. Fortunately and if you snag multiple enemies, Warlord's Challenge can set up some amazing wombo-combos. Decimate - My heroic of choice for Garrosh simply because of the fact it deals AOE damage, deals 100% more damage to heroes, slows for 30% for 1.5 seconds, has 3 charges and also has its cooldown reduced by 1 second for each hero hit. It's amazing for softening up a group of enemies, causing some bried crowd control, but also allowing Garrosh to kite and peel for his team. The fact all 3 charges have very short cooldowns (8 seconds per charge) means that you'll rarely be without the full amount. What's also particularly strong about Decimate is if you use it after having pulled/thrown a player - they're pretty much doomed. With Groundbreaker now longer pulling an enemy, Unrivaled Strength is fairly mandatory. Increasing the throw distance of Wrecking Ball by 25, and its damage by 125%, it allows Garrosh to displace enemies with much greater ease. Indomitable allows Garrosh to become Unstoppable and is an active ability on a 40 second cooldown. The Unstoppable effect lasts for 1.5 seconds and allows Garrosh to escape if under heavy pressure, but also dive deep if he's being hit by crowd control. Three of Garrosh's level 7 talents are all fantastic, and all serve a very different purpose based on the composition you're facing. For the most part, I've found Into The Fray has the most value as it allows you to throw an ally in any direction. Acting similarly to the use of Wrecking Ball, it provides Garrosh with the ability to further protect an ally or initiate a fight by hurling a team-mate at the enemies back-line. Variable: Against a basic attack heavy composition, take Intimidation. When you use Groundbreaker, all enemies hit by it have their attack speed reduced by 40% for 4 seconds. Considering Groundbreaker can have its cooldown reduced to as little as 5 seconds, this can seriously restrict the damage potential of a team. Variable: Against an ability heavy composition, take Oppressor. When you use basic attacks against enemy heroes, you'll lower their Spell Power by 40% for 2.5 seconds. This duration buys you enough time to hit at least 2 players, causing a near permanent Spell Power debuff. If you're a solo Warrior, take Warlord's Challenge. You need the additional crowd control in order to protect your team and keep enemy Heroes locked down. Variable: Purely because Decimate provides so much utility, it proves to be a particularly strong heroic that has multiple uses. Whether used back-to-back for a quick spike of AOE damage, or used to snare the enemy team as your own escapes, the slow, combined with its cooldown reduction, is incredibly valuable. Blood Craze allows Garrosh to gain healing over time (worth 10% of his maximum health) over 3 seconds. Considering the low cooldown, it ensures he always has incoming health. Variable: Allowing Garrosh to effectively become Artanis every 5 seconds (with your level 1 Talent completed), Defensive Measures provides a huge shield (767 at level 20) that lasts for 6 seconds. As long as you can reliably land your Groundbreaker stim every time it's off cooldown, Defensive Measures provides incredibly mitigation. Earthshaker allows Garrosh to stun anyone he throws with Wrecking Ball. Although the stun is brief (0.6 seconds), it affects anyone caught near the impact. Best of all, it also affects the hero originally thrown, meaning if you do pull them with Groundbreaker, followed by Wrecking Ball and Decimate, it's a trio of crowd control few can survive. Titantic Might allows Garrosh to throw two targets with Wrecking Ball instead of one. Considering you need the disruption (and the stun that it causes on landing), it's fairly mandatory now Groundbreaker doesn't pull enemies towards you. These Hero Threat Levels (1 being lowest threat and 10 being highest threat) are to help you determine which enemy Heroes can give you a headache. For the Heroes listed here, take extra care as they're particularly dangerous for Garrosh. Chromie: You'll never get near her and your lack of mobility pretty much ensures she'll always be bombarding you with little worry. Falstad: His basic attack range, Hammerang, Barrel Roll and Mighty Gust all ensures you'll rarely reach him, even with a well placed Groundbreaker. This list of tips and tricks are just a handful of things we think will help your Garrosh play. We'll continue to add to the list as required and if you have any tips you'd like to share, let us know in the comments below and we'll place them here. 1. Remember that your armor gain from your trait is directly linked to your lack of health. If you get too low, you can still be burst down (you'll just mitigate more of any incoming damage). 2. Staying around the 30 armor mark provides Garrosh with a solid bank of health and mitigation from all sources of damage. You can go lower, but it's risky. If you do, be ready with Bloodthirst or have a support handy. 3. Armor Up provides armor that mitigates damage from ALL sources - Basic and Spell Power. 4. If you're starting a fight, don't be in a hurry to replenish your health with Bloodthirst. It's a good idea to let your trait stack up some so you can outlast the opposition by rotating between: health loss > gain armor > regaining health > health loss (repeating the process). 5. Groundbreaker will still deal damage even if you don't stun an enemy. The radius isn't small, so you can easily snag a few enemy heroes for some AOE pressure. 6. Ideally you want to be casting Groundbreaker to take into account the 1 second delay. You WANT to stun, but to also setup your Wrecking Ball/Decimate combo. Any hero stunned can be easily spiked by your team. 7. Don't be afraid to use Groundbreaker to peel for a team-mate under pressure. You don't always have to use it offensively. 8. Bloodthirst provides health return based on your current lost health, not your maximum health pool. Used at relatively high health, it provides little healing. 9. With a 12 second cooldown, you cannot afford to waste Bloodthirst if you're below 50% health. You may need it if you quickly suffer damage. If you can, save it for when you're on about 15-20% health to ensure you get back up to a safe amount of health. 10. If you're fighting 1 on 1 against an opponent, you can afford to be liberal with Bloodthirst any time after you drop below 50% health. Combined with your armor, you'll outlast most heroes. 11. Wrecking Ball is often strongest when used immediately after Groundbreaker as it'll ensure you've only got a hero that you can throw (rather than a minion). 12. If an enemy hero gets near to your Keep, use Wrecking Ball to throw them over your gate. They'll be trapped inside and can be killed quickly. 13. Wrecking Ball can throw an enemy hero in any direction, within the radius of its telegraph. If neccesary, throw enemy heroes away from you to protect yourself or your team. 14. Practice makes perfect with Wrecking Ball, as it's just as easy to accidently throw a minion as it is to throw a hero. 15. Remeber that the red Horde symbol represents the target you will throw if you activate Wrecking Ball at that moment. 16. If you've caught a hero with Groundbreaker > Wrecking Ball, always use Decimate against them, multiple times, in order to restrict their chances of escaping. 17. Decimate has a 1 second delay between each charge, so be sure to swing and move, before your next swing, to ensure you continue to hit your target.